The closer you are to the park, the nicer the building. Luxury brownstones and prewars line the park and the streets around it, giving way to slightly more affordable tenements and new constructions. 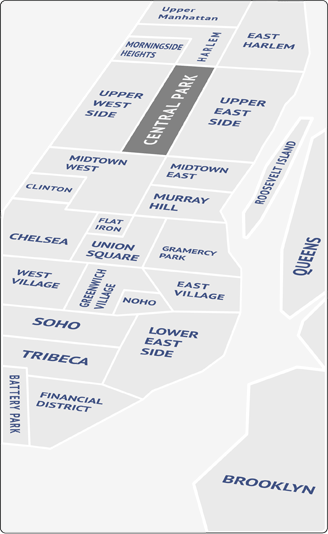 Larger apartments are in short supply in Gramercy, so if it’s a lot of space you need, expect to pay. While it’s not exactly the thriving foodie haven of the East Village, Gramercy does boast some outstanding restaurants. The Gramercy Tavern on 20th Street is consistently voted one of the best places in the city, and hip new establishments like Fleur de Sel are springing up all over the neighborhood. Gramercy still has a reputation as a no-man’s-land of nightlife, but the fact is that things have changed considerably in the last 10 years. Along 3rd Avenue, a genuine scene of chic bars has emerged, and hipsters and regulars alike flock to the seedy, welcoming arms of The Bar on Gramercy Park. Pete’s Tavern, a favorite of O. Henry’s, is the oldest surviving bar in New York City, dating back to the Civil War! Veteran New Yorkers will tell you that the Lower East Side is today what the East Village was 20 years ago. The influx of young blood will continue and accelerate, transforming the neighborhood further into the hip place to be in Manhattan.